January 31, 2012 | David S. Maldow, Esq. XConnect allows video endpoints on connected service provider networks and private networks to route calls directly to other video end-points. 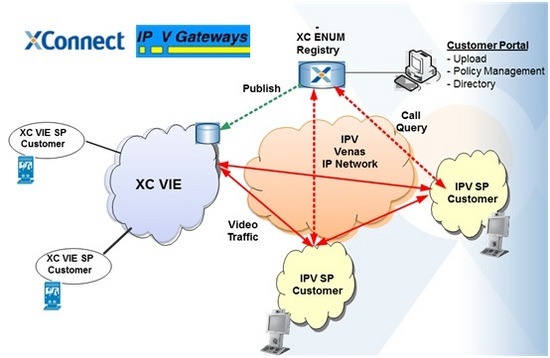 The partnership with IP-V Gateways allows these connections to transit over disparate connected networks while maintaining the quality needed for high-quality telepresence and video. XConnect, a global provider of registry services for VoIP calls and voice peering provider, and IP-V Gateways, the largest wholesale provider of telepresence and videoconferencing network peering and exchange services, recently announced a partnership to simplify how telepresence and videoconferencing calls are made and networks are peered for crystal clear quality. To help us understand some of the technical elements of the recent XConnect and IPV agreement we spoke with Pat Montani (CEO - IPV Gateways) and John Wilkinson (SVP - XConnect). Have you ever wondered how the carriers and video managed service providers can provide QoS video between disparate carriers and private networks? Most of the networks plug together at carrier-neutral "telecom hotels" where telepresence and videoconferencing exchange providers can manage physical connections, match QoS tags, and handle security. The biggest is IP-V Gateways which connects over 200+ carrier and private networks with 50,000+ connected video endpoints and regularly connects to 300,000+ ISDN endpoints. Telepresence Options publisher Howard Lichtman described IPV as "the most important company in the telepresence and videoconferencing industry that you have never heard of." For more information on IVP, please read Howard's interview with Pat Montani, CEO of IVP. XConnect has extensive experience in the Voice over IP (VoIP) telephony world, creating federations (agreements) between service providers allowing them to use a common set of terms and policies to mutually exchange voice calls over IP. XConnect's ENUM registry services further support the federation members' ability to interconnect. To vastly oversimplify, the registry allows VoIP calls to be dialed and routed intelligently. It provides standardized dialing and understands the characteristics of the endpoints in its directory in order to ensure they connect in a way that makes sense. To simplify even further, their registry is like a "yellow pages," which allows each listing to be called with a standard number format. The idea is to make it as easy as PSTN dialing for phones, where we use a standard 10 digit number regardless of carrier, network, or type of phone. XConnect has leveraged their VoIP expertise in the video arena by creating the VIE (Video Interconnection Exchange), which we expect to be a key element of this partnership. The combination of XConnect's registry services with IPV's interconnection services will make life easier for countless videoconferencing users, whether they are aware of it or not. "This announcement today is very similar to the one where Steve Jobs said, "We've reached the beginning of the post-PC era, while acknowledging PCs have "taken us a long way" and that the transition could be lengthy, and uncomfortable for some". We are at the same point in the video conferencing industry and this announcement declares the post Videoconferencing controlled era dead. For over a hundred years, the carriers globally have been able to deliver secure, high quality, economical voice calling globally across multiple platforms, all agnostic of the end point devices. Companies like XConnect play a very big part in making the voice world efficient and together with IPV and others, we are bringing the same core network functionality for voice to the video world. Customers expect best value for their communications dollar, they expect to connect to anyone, anywhere, no matter the network or the end-point device. Today, IPV leads the world in moving private network video traffic for major corporations. Together with our partners we listened carefully to what corporate clients wanted. This knowledge and ours coupled with Xconnect's leadership position allows far greater reach, efficiencies and value and together with our managed service and carrier partners we will deliver what corporations and customers expect and that is to realize value from their investment in VC infrastructure and be now able to call their customers, partners and suppliers anywhere globally, just like they can today from their phones and mobile devices. History does repeat itself and 100 years of accumulated knowledge in switching and telecom management are coming to bear on the hardware centric, VC hardware controlled industry. We declare this the post VC controlled era and like the post pc era declared by Steve, customers can expect greater efficiencies and value when calling outside their network." The history of videoconferencing is riddled with so many false starts and disappointments that even under the current deluge of adoption related news, we temper our optimism. Even so, it is safe to say that this is an exciting time for believers in videoconferencing. Having bested the first major hurdle of videoconferencing adoption (providing a quality experience), we are now focusing on the next big challenges (usability, interop, availability, reach, etc.). Early video offerings suffered from low resolution, blurring, smearing, poor audio and other experience marring issues. Fortunately, the VC industry has made enormous progress in this area, particularly in recent years, due to a combination of factors including more powerful hardware and smarter software. The experience provided by today's mid range videoconferencing offerings is well beyond the threshold required for mass adoption, to say the least. Videoconferencing interoperability, and connectivity between networks, is significantly more complicated than audio conferencing. As long as it is quicker and easier to connect with someone on the phone than video, people will do so, even if video is preferable. One obvious approach to this problem is to apply the lessons learned over 100+ years of audio connectivity to video. XConnect and IPV are working together, behind the scenes, to do just that. Their goal is a long term transformation of the current state of videoconferencing connectivity to a model similar to audio, with seamless connectivity between disparate networks, providers, equipment, protocols, etc. powered by a universal directory/registry system which intelligently maps users and addresses across the network. The end result for users is that the utility of video--who you can call and what you can do--will continue to rise. We expect the XConnect directory to be one of many competing (and ultimately federated) video directories including Skype and we expect IP-V Gateways to be one of many competing platforms to connect carrier and private networks securely at high speeds and quality. We are just starting to get a glimpse at how the future will look but one thing is certain: It's getting a whole lot easier to make a quality video call! David Maldow is a visual collaboration technologist and analyst with the Human Productivity Lab and an associate editor at Telepresence Options. David has extensive expertise in testing, evaluating, and explaining telepresence and other visual collaboration technologies. David is focused on providing third-party independent testing of telepresence and visual collaboration endpoints and infrastructure and helps end users better secure their telepresence, videoconferencing, and visual collaboration environments. Most of the networks plug together at carrier-neutral \"telecom hotels\" where telepresence and videoconferencing exchange providers can manage physical connections, match QoS tags, and handle security. The biggest is IP-V Gateways which connects over 200+ carrier and private networks with 50,000+ connected video endpoints and regularly connects to 300,000+ ISDN endpoints. Telepresence Options publisher Howard Lichtman described IPV as \"the most important company in the telepresence and videoconferencing industry that you have never heard of.\" For more information on IVP, please read Howard's interview with Pat Montani, CEO of IVP. XConnect has extensive experience in the Voice over IP (VoIP) telephony world, creating federations (agreements) between service providers allowing them to use a common set of terms and policies to mutually exchange voice calls over IP. XConnect's ENUM registry services further support the federation members' ability to interconnect. To vastly oversimplify, the registry allows VoIP calls to be dialed and routed intelligently. It provides standardized dialing and understands the characteristics of the endpoints in its directory in order to ensure they connect in a way that makes sense. To simplify even further, their registry is like a \"yellow pages,\" which allows each listing to be called with a standard number format. The idea is to make it as easy as PSTN dialing for phones, where we use a standard 10 digit number regardless of carrier, network, or type of phone. XConnect has leveraged their VoIP expertise in the video arena by creating the VIE (Video Interconnection Exchange), which we expect to be a key element of this partnership. \"This announcement today is very similar to the one where Steve Jobs said, \"We've reached the beginning of the post-PC era, while acknowledging PCs have \"taken us a long way\" and that the transition could be lengthy, and uncomfortable for some\". We are at the same point in the video conferencing industry and this announcement declares the post Videoconferencing controlled era dead. For over a hundred years, the carriers globally have been able to deliver secure, high quality, economical voice calling globally across multiple platforms, all agnostic of the end point devices. Companies like XConnect play a very big part in making the voice world efficient and together with IPV and others, we are bringing the same core network functionality for voice to the video world. Customers expect best value for their communications dollar, they expect to connect to anyone, anywhere, no matter the network or the end-point device. Today, IPV leads the world in moving private network video traffic for major corporations. Together with our partners we listened carefully to what corporate clients wanted. This knowledge and ours coupled with Xconnect's leadership position allows far greater reach, efficiencies and value and together with our managed service and carrier partners we will deliver what corporations and customers expect and that is to realize value from their investment in VC infrastructure and be now able to call their customers, partners and suppliers anywhere globally, just like they can today from their phones and mobile devices. History does repeat itself and 100 years of accumulated knowledge in switching and telecom management are coming to bear on the hardware centric, VC hardware controlled industry. We declare this the post VC controlled era and like the post pc era declared by Steve, customers can expect greater efficiencies and value when calling outside their network.\"